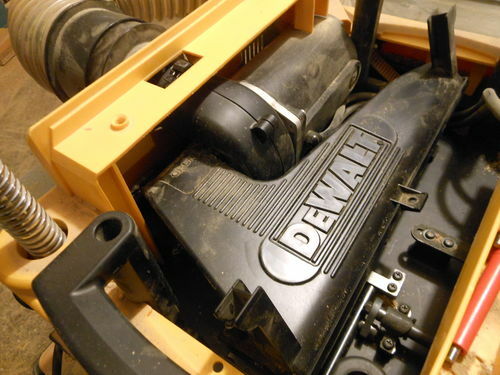 Have you ever noticed the depth crank on your Dewalt planer getting tougher to turn? Do wood chips collect under the top cover near the blades? If so, then I may have the solution for you. 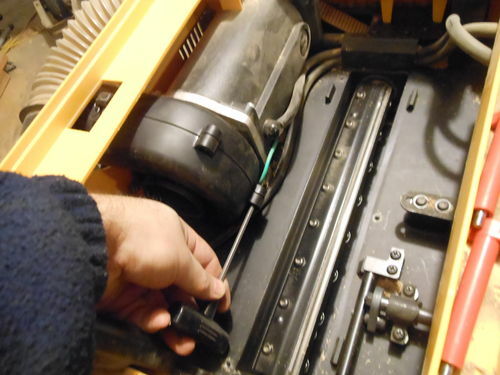 Unplug the planer and remove the top cover with the supplied hex wrench. 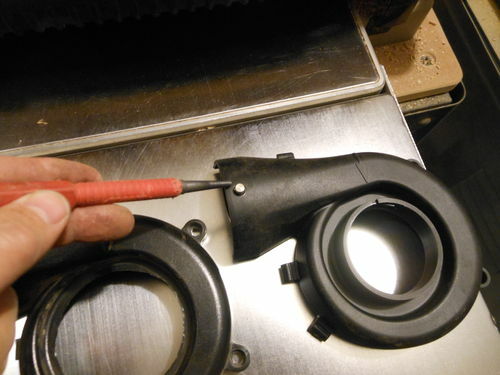 Remove the dust collector fitting by pressing the spring loaded pin, and twisting the fitting. 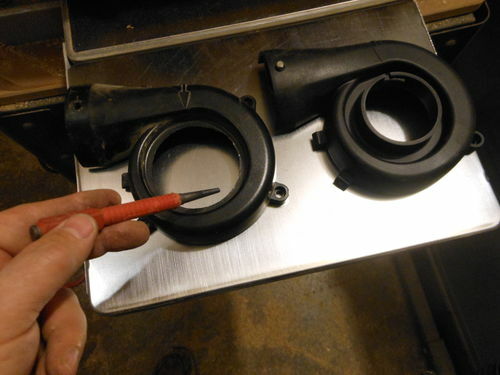 Remove the three red thumbscrews to loosen the dust shroud. Carefully lift the infeed side of the dust shroud, and gently pull it to the side to remove it. Inspect the dust shroud for cracks or warpage. Mine was cracked, however replacing it did not solve the problem. Now you can remove the outer portion of the fan housing. 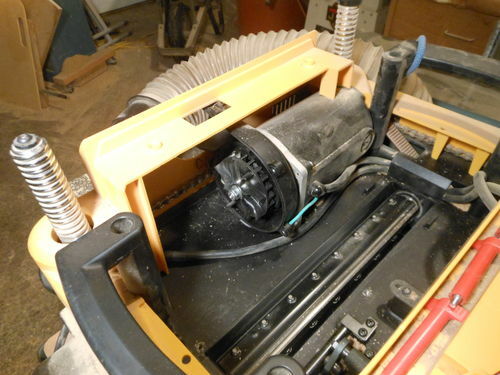 Notice how the old fan housing is broken, allowing wood chips to fill up the inside of the planer. Remove the spring clips from the old part, and install them on the new part. Next remove the spring loaded pin from the old fan housing. 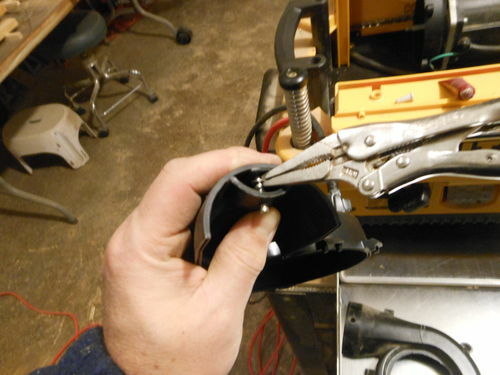 Use needle nose pliers to remove the retaining ring. Then the pin and spring can be removed. 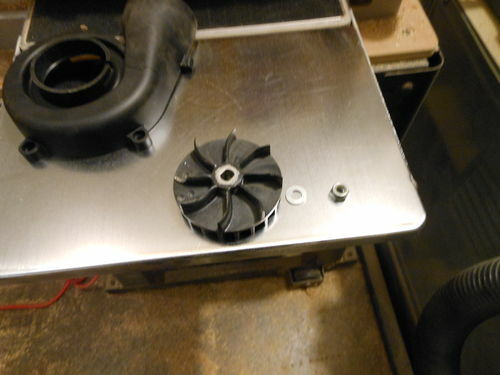 Next reinstall the pin, spring and retaining ring on the new fan housing. With the outer half of the fan housing removed, you can see the chip-ejection fan. 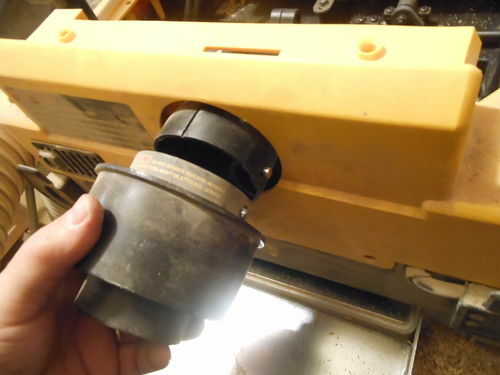 Use a strap wrench and 13mm socket to remove the fan. This is what the fan looks like. Now remove the three Phillips screws securing the inner half of the fan housing. A short screwdriver or Phillips bit in a socket wrench is required. This is what the motor looks like with the fan and housing removed. 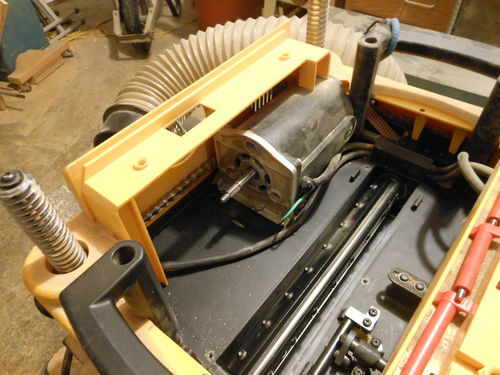 Replace the broken fan housing, and reassemble the planer. Incidentally I tried running the planer without the chip ejection fan because I had heard claims that it makes the planer quieter. I tested the planer at no-load speed, and during routine planing. I found that there was no significant difference in the sound level with the fan removed. If anything, the sound was higher pitched and the dust collection was not as good. Even with the fan removed the airflow from the motor will slowly inflate your D.C. bag. I decided to reinstall the fan. In my case replacing the fan housing solved my problem. 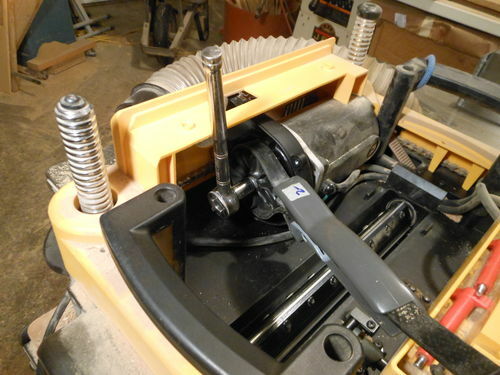 Chips no longer collect in the planer, and the depth crank operates normally. Thanks for this. 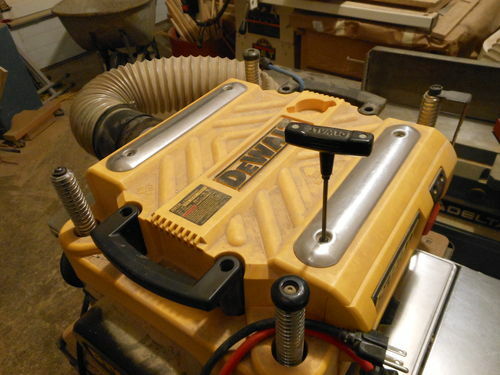 I have this planer, per your suggestion several months ago, and thoroughly enjoy it. 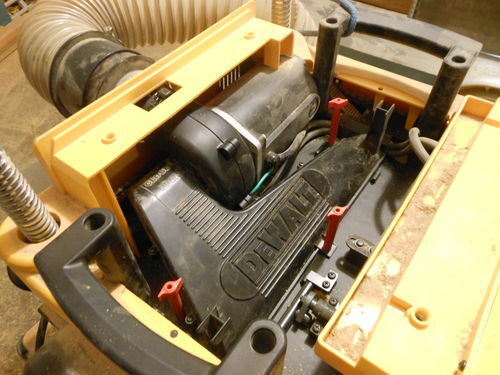 Do you find it necessary to turn on the DC with the planer running? 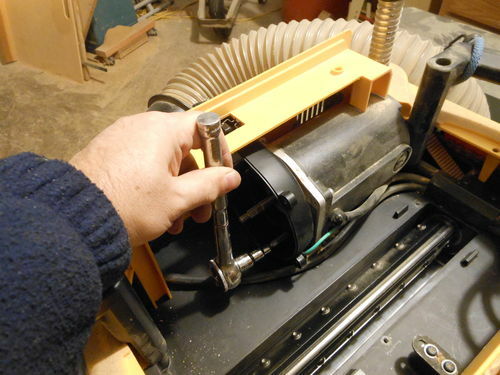 I wasn’t sure if the air flows could put unnecessary stress on either motor (DC or the planer fan). I’ve heard running parallel/connected DCs can cannibalize the motors, wasn’t sure if the same thing could happen with the DC/planer fan. I always run mine with a DC attached, but I have heard success stories blowing chips into a hose / garbage can setup. People who have tried shop vacs typically say that doesn’t work very well. Very useful post Willy, Thanks! Thanks Willy, I have not noticed excessive chips inside, but I might someday. Have you thought about changing to a Helix head? 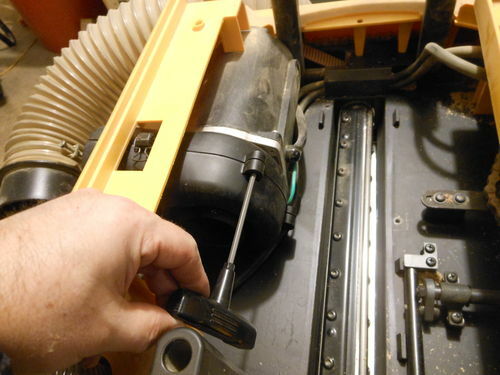 I put one on my jointer and I just love it. Been holding off on the planer though. That’s funny you ask about the Shelix, there is one in the mail for me as we speak. I put a Shelix cutter in mine, and it reduced the noise level like you wouldn’t believe. Still need hearing protection though, especially if you are planning a lot of material. It has been the single best upgrade to the planer I have made (don’t have dust collection yet, use the garbage can setup).